Are you confident about the stability of the business in your territory because you have been in that territory for years? Don’t be! There is either a new sales rep or an old sales rep with a renewed focus ready to take that business. In this podcast, I share the story of two different sales reps that I rode along with recently and what I learned is critical to the business you currently enjoy and the business you hope to win in the future. 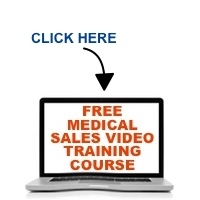 Take 10 minutes and see if you are more like Glenn, or more like Donna and you’ll have an idea as to what your future in medical sales looks like and how to change it if necessary.